It’s been a slow holiday season but work is beginning to pick up again. For the first task of the new year, Katie and I installed the back door on the second floor. 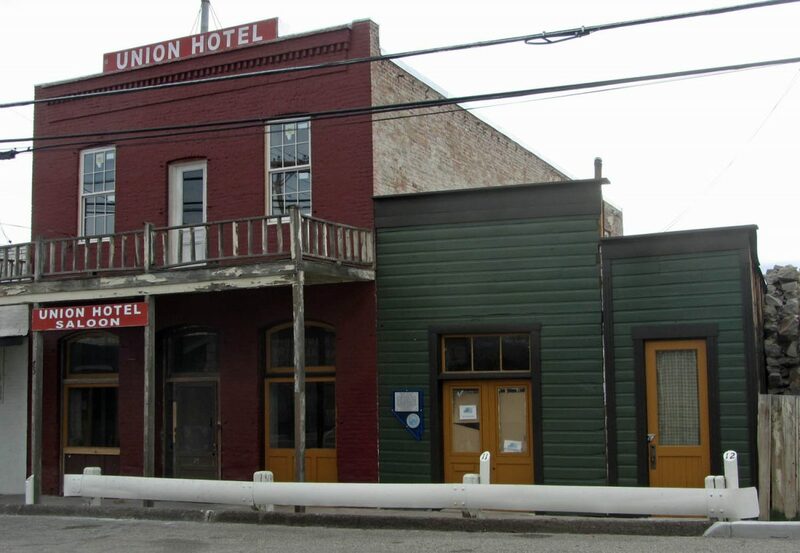 The recycled door was donated to us from the train depot restoration across the street and it came complete with hinges and jamb. It was pretty easy to slide into place but the real challenge was to get it leveled and operating correctly. To get this done, the jamb was centered in the brick door opening which was a very loose fit. Then, it was shimmed with thin strips of wood and nails were driven through the jamb and the shims into wood nailing blocks that were embedded in the bricks. Of course, the first attempt was not level so the nails had to be pulled and the door shimmed up again until we got it right. 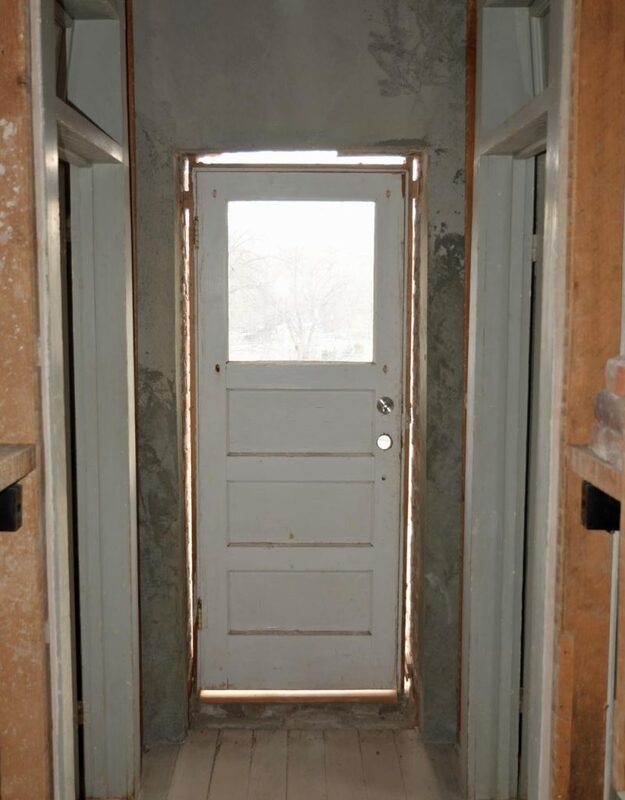 This was accompanied by an inspired collection of four letter words in combinations not often heard but in the end, the door works fine and is waiting for trim and spray foam to fill up the gaps between the jamb and bricks. 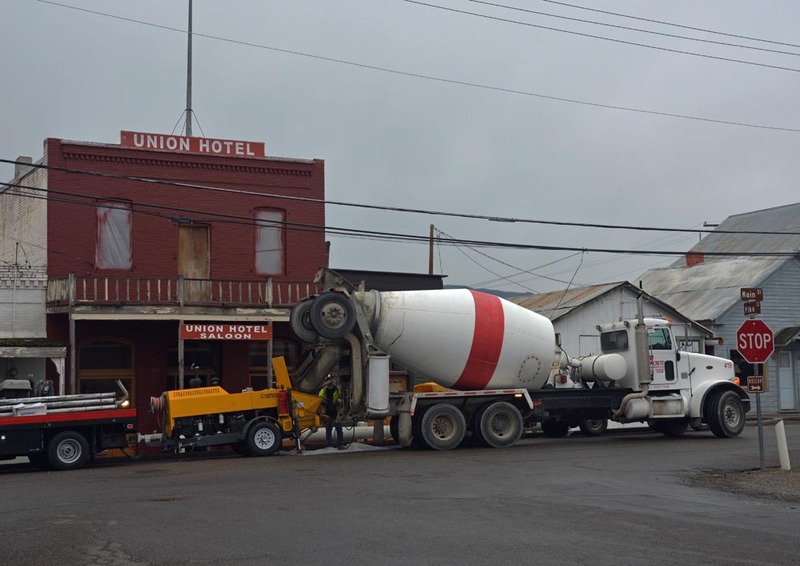 While this was happening, the contractors were busy downstairs applying the last of the shotcrete. 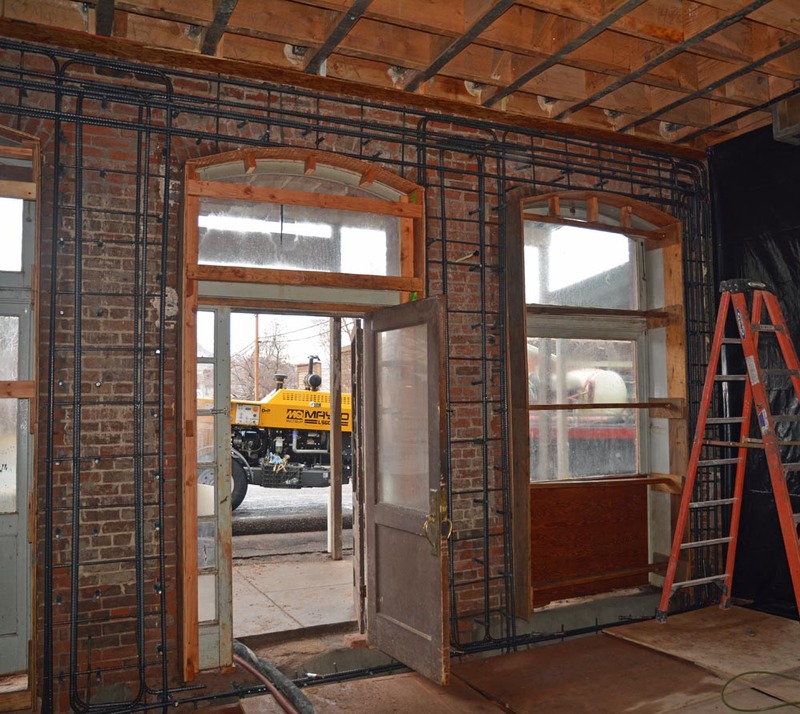 The rebar was wired in with care and wooden forms were installed around the windows to keep the concrete where we wanted it instead of all over the place. We were somewhat successful but some of the concrete penetrated and hardened behind the salloon door jamb which pushed the jamb an eighth inch out of plumb. Now, the door refuses to shut and the only remedy is to take the door frame apart and rebuild it. The nice part about this was that we were able to recycle many of the same four letter words we used upstairs. Heck, they were already paid for so why not? 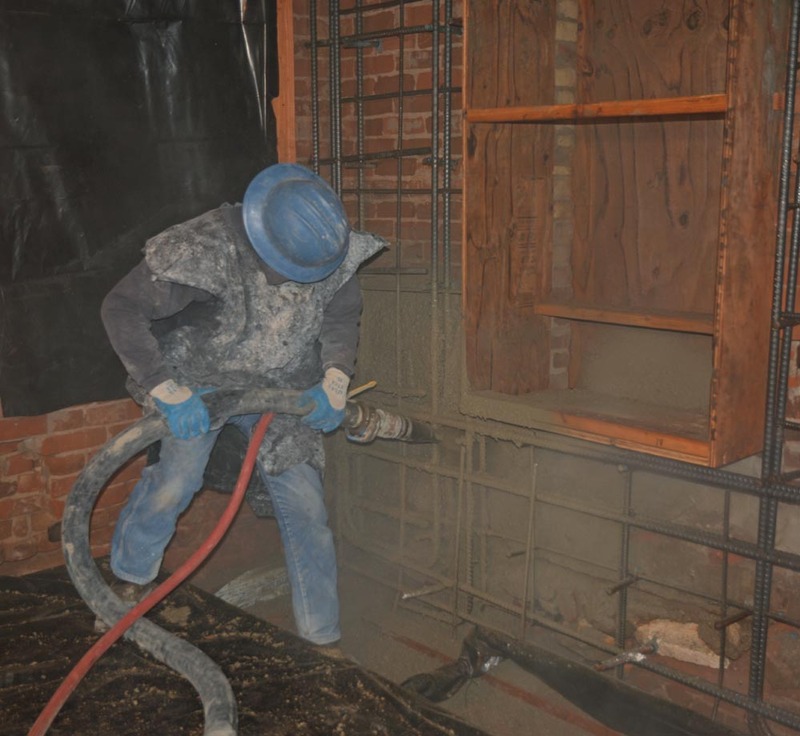 Once the shotcrete application began, it got pretty messy. But when the spraying was done, the dust settled and the troweling was much more peaceful. 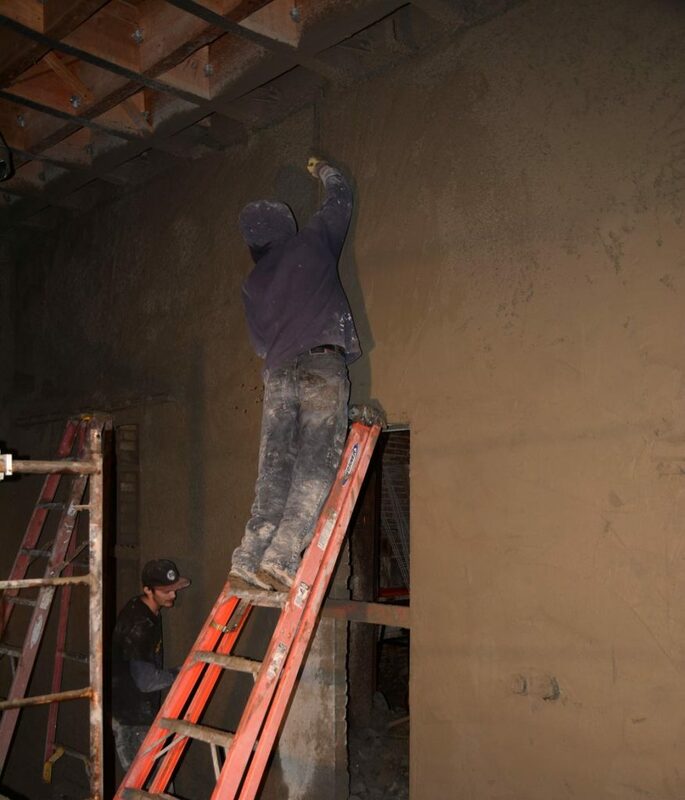 Eventually, the concrete wall will have drywall applied over it so even the trowel work will be hidden forever. One would think with all that we’ve spent on the seismic retrofit, we’d have something worth looking at but the truth is that it will be entirely concealed. The only indication of what’s behind the walls will be the slight whimpering noise I make while trying to figure out where all the money went.